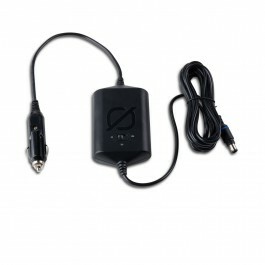 Goal Zero 6mm Output to Female Cigarette Adapter, 1 Year Warranty. Connects Goal Zero Sherpa and Yeti Power Stations to 12V DC output. Goal Zero Regulated Charge Cable 8mm for Yeti Power Stations, 1 Year Warranty. Used to safely and efficiently charge a Goal Zero Yeti Lithium or Lead-Acid from a 12V source, featuring a protective 15A user-replaceable fuse. Goal Zero Boulder 200W Briefcase Solar Panels & Bag, 1 Year Warranty. The largest of our monocrystalline solar panels (200W total) in an easy-to-carry briefcase form makes for the ultimate on-the-go setup. Whether you’re boondocking, camping, or needing panels for your backup, the Boulder 200 Solar Panel Briefcase is ideal for any off-grid scenario. Comprised of two Boulder 100 Solar Panels in an easy-to-carry briefcase form. Includes integrated kickstands, handle and a protective canvas carry bag. What Can The Boulder 200 Briefcase Solar Panel Charge? The solar panel does not hold a charge - it produces power when it is exposed to sunlight. Connect it to recharge a portable power station. The Boulder 200 Briefcase is best used for recharging Goal Zero Yetis. What Goal Zero products Work Best With The Boulder 200 Briefcase ? Boulder 200 Briefcase works best with all of our medium to large power stations. Yeti 400 Power Stations 4-8 Hours (NOTE: Connecting a Yeti 400 Power Station to the Boulder 200 Briefcase requires an Anderson to 8mm Connector cable). Yeti 1000 Lithium Power Stations 10-20 Hours. Yeti 1250 Power Stations 12-24 Hours. Yeti 1400 Lithium 14-28 Hours Yeti 3000 Lithium 30-60 Hours. 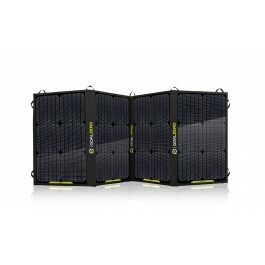 Goal Zero Boulder 100W Solar Panel, 1 Year Warranty. Rugged, durable, and rigid. The Boulder 100 Solar Panel is built with strong tempered glass and an aluminum frame with added corner protection for temporary or permanent installation. Equipped with an integrated kickstand to help get optimal angle to the sun. Use with a Goal Zero portable power pack or portable power station to charge your gear day or night. 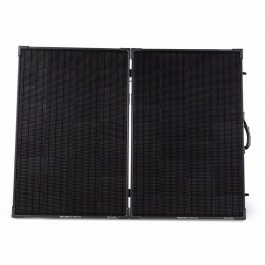 What Can The Boulder 100 Solar Panel Charge? Does The Boulder 100 Give a Full 100 Watts? Goal Zero 12V Regulated Cable, 1 Year Warranty. Used to regulate the APP output of a Goal Zero Yeti Lithium to a consistent voltage, improving compatibility with 12V-powered devices. *Please note, not compatible with Goal Zero Yeti 400 Lithium Portable Power Station. Goal Zero Solar Charging Optimisation Module (MPPT) for Yeti Lithium Power Stations. An external maximum power point tracker (MPPT) actively monitors and optimises the energy source to maximize power input to your Goal Zero Yeti Lithium, resulting in up to 40% faster charge times, especially from solar panels. The module is an external add-on built to optimize charging for the Yeti 1000 Lithium and Yeti 1400 Lithium Portable Power Stations. Please note: Not compatible with lead-acid Yetis or Yeti 400 Lithium. Already installed on Goal Zero Yeti 3000 Lithium Portable Power Station and Roll Cart. Goal Zero Boulder 100W Briefcase Solar Panels & Bag, 1 Year Warranty. Rugged, durable, and rigid. The Boulder 100 Briefcase Solar Panel is built with strong tempered glass and an aluminum frame with added corner protection for temporary or permanent installation. Composed of two Boulder 50 Solar Panels (100 watts total) chained together and connected by a hinge. Equipped with an integrated kickstand to help get optimal angle to the sun. Included a protective canvas bag for easy carrying. Use with a Goal Zero portable power pack or portable power station to charge your gear day or night. This panel has an 8mm connector and will easily plug and play with the Yeti 400 and Yeti 1250 for perfect connectivity. 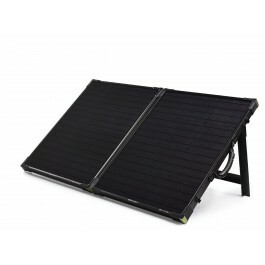 What Can The Boulder 100 Briefcase Solar Panel Charge? The solar panel does not hold a charge it produces power when it is exposed to sunlight. You can store the power it produces in a portable recharger. The Boulder 100 Briefcase can be used to power any Goal Zero power station. If you're looking to recharge things like headlamps, phones, and other USB devices directly from the sun, check out the Goal Zero Foldable Nomad Plus Solar Panels. What Goal Zero products Work Best With The Boulder 100 Briefcase ? The Boulder 100 Briefcase can be used to power any Goal Zero recharger. For the amount of Watts it gives, it will be most effective with the Yeti 400, Yeti 1250, Yeti 1400 or Sherpa 100. 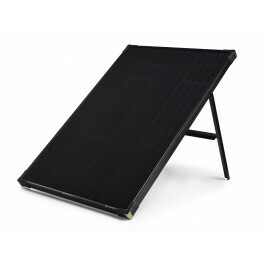 Goal Zero Nomad 100W Solar Panel, 1 Year Warranty. Portable, rugged, and powerful, the largest Goal Zero foldable panel is equipped with 100 watts of monocrystalline, engineered to charge Goal Zero portable power stations from the sun. Designed for mobile basecamps and die-hard adventurers features a standard MC4 connector for third-party charge controllers and built-in charging cable for the Yeti 400 and Yeti 1250 Solar Generators. Can be chained in series or parallel to collect more power from the sun. We recommend purchasing one of the Goal Zero portable rechargers, to pair with your panel with a Goal Zero battery for a complete collect > store solution. Goal Zero Yeti 1000 Lithium Portable Power Pack 96.8Ah, 1 year warranty. The Goal Zero Yeti 1000 Lithium is the next generation of portable, award-winning power. Engineered from the ground up, the Goal Zero Yeti Lithium is one of the most versatile and innovative power stations on the market. Its built-in surge allowances and multi-stage protection means great compatibility with more devices ranging from lights to laptops, refrigerators to power tools, giving you the confidence to power anything, anywhere. Goal Zero invented a new way to power more devices through a highly efficient, multistage inverter, which means increased compatibility and capability. The robust Goal Zero Yeti Lithium Portable Power Station is designed to be your source of reliable power both indoors, and out. From USB to AC, the Goal Zero Yeti 1000 Lithium features the outputs you need to get the job done both indoors and out. The multi-stage surge capability of the AC inverter sets a new industry standard for portable power and allows you to power more devices than ever before – power tools, water boilers, refrigerators, and more. Keep your Goal Zero Yeti 1000 Lithium powered up from the wall or from the sun (solar panels sold separately). DO NOT ATTEMPT TO CHARGE YOUR YETI LITHIUM FROM A 12V SOURCE, for vehicle charging questions please contact Goal Zero Australia technical support. *Please note: 110V US Version shown in pictures. 240V AU Plug will be shipped. 110V US Version shown in pictures. 240V AU Plug will be shipped. Q:Why is the light on the 12V button blinking on my yeti 1000 Lithium? A blinking light on the 12V button indicates the 12V car port has been shut off to protect whatever you have plugged in; you should also see RESERVE MODE blinking on the display. Recharge your Goal Zero Yeti 1000 Lithium as soon as possible to continue powering your device. Q:How do I know if my device will work with the Goal Zero Yeti 1000 Lithium? First, you’ll need to determine the amount of power your device requires. This may require some research on your end, a good internet search or examining the user guide for your device should suffice. Second, you will need to check the capacity for the individual output ports. For example, the Goal Zero Yeti’s AC port is powered by an inverter that allows for 1500W of power. This means if your device is pulling more than 1500W for an extended period of time, the Goal Zero Yeti’s inverter will shut off. Another number to watch for is the surge rating of your device as compared to that of the port. The Goal Zero Yeti inverter has an advanced surge management system that will maximize its compatibility with various devices, but there will still be items that will surge at a higher rate, and for a longer time, than the Goal Zero Yeti can manage, in which case the port will turn itself off. Finally, once you know your device is compatible, you’ll want to determine how long you’ll be able to power your gear from the Goal Zero Yeti. Here’s a quick and dirty lesson in power. All GOAL ZERO power packs and solar generators have a number in their name, ex. Guide10 Plus Power Pack, Goal Zero Yeti 1000. These numbers refer to the Watt Hours (Wh), or the amount of energy that can be stored in each recharger, and how you’ll know if your gear is compatible with each recharger. For example, a 200Wh recharger should run a 100W light for 2 hours (200/100=2). If your gear falls within the 1000Wh capacity of the Goal Zero Yeti, you’ll want to check the restrictions on each of the output ports. Another factor in the math is how much power is being converted going from the Goal Zero Yeti battery to the device you are powering/charging. In some situations, like when running a 12V device, such as the LAL 350, directly off the 12V port, there will be no conversion and so no additional losses. In using the USB ports to charge a phone, you add a layer of conversion (12V battery in the Goal Zero Yeti is being converted to a 5V USB output), which introduces around 10% of losses. When using the inverter, there are two layers of conversion (12V to high voltage, DC to AC). The least efficient way of using the battery in the Goal Zero Yeti is to use an AC-DC adapter off the AC ports, as is the case if you use a phone wall charger to charge your phone, as it adds yet another layer of conversion in the wall adapter. All Goal Zero models sold in Australia without universal outlets come with Australian style outlets as standard. Q:Why is the light on the AC button blinking on my Yeti 1000 / 1400 Lithium? A blinking light on the AC button indicates that at the current load, the AC inverter will be shutting off soon; you should also see RESERVE MODE blinking on the display. Recharge your Goal Zero Yeti as soon as possible to continue powering your device. Once the AC inverter has shut off, the Yeti will attempt to reset itself three times. After three attempts, the AC inverter will remain off until you physically reset it by pushing the AC button or by recharging the battery a small amount. Q:Can I replace the battery in my Goal Zero Yeti 1000 / 1400 / 3000 Lithium? Yes, the battery inside the Goal Zero Yeti 1000 / 1400 / 3000 Lithium is designed to be easy to replace. 1. Turn your Goal Zero Yeti upside-down and place its top surface on towel or blanket over a hard surface. 2. Remove the 10 screws on the bottom plate. 3. Unscrew the 2 bolts that connect to the battery terminals. 4. Pull on and disconnect the data connector to the battery. 5. Remove the 8 screws holding the battery pack to the Goal Zero Yeti. 6. Lift the old battery out of the body of the Goal Zero Yeti **This battery is HEAVY. Use caution and proper technique when lifting. 7. Insert replacement battery and reassemble in reverse order of steps above. 8. Replaceable batteries will be available from GoalZero.com. Q:What type of battery is in my Goal Zero Lithium Yeti 400 / 1000 / 1400 / 3000? 1. Lithium Ion batteries can store and release a lot of energy in a short period of time. The batteries in your Goal Zero Yeti are in a protective enclosure with a sophisticated battery management and protection system controlling its terminals to the outside world. 2. It is critical that your battery does not get wet as moisture and water can get into the battery cells behind the protection circuitry and bypass that protection. Q:How do I know if my Goal Zero Yeti 400 / 1000 / 1400 / 3000 Lithium is charged? To check the charge level of your Goal Zero Yeti, refer to the LCD Battery Display. When lit up, you’ll see a battery outline with 5 segments, indicating the current charge level. It is okay to use your Goal Zero Yeti even when it’s not fully charged.